The color of silk wedding sarees is endlessly varied. You can choose any color you like, and which would bring a glow to your face. Traditionally, depending on which part of India you belonged to, the color of choice was red or cream / white. You can stiil choose a vibrant red silk saree for your wedding. Or you can choose a saree that complements your complexion and matches your jewelry too. Usually, shades of red and magenta are chosen by most brides to shine in the crowd, and silk sarees look even more beautiful in the bright, glittering lights of the venue. You can choose a combination of reds and whites or red and gold, even orange and copper shades look stunning. The traditional Indian nine yards silk saree is much in demand all over the world. These sarees are woven by craftsmen/women in different parts of India, and each type of silk saree is amazing and excellent. These woven sarees last for decades and sometimes are even passed down through generations, as they remain pristine and beautiful. Banarasi silks are exquisite sarees and are a favorite choice of brides. Made in Varanasi, these sarees have wonderful silver and gold ‘zari’ or brocade and opulent embroidery makes them the top choice. Kanjeevaram sarees can be perfect wedding sarees made from silk. Belonging to Tamil Nadu and the quality of silk is exceptional, heavy and have a glossy texture. They look magnificent with their gold and silver weaves and gorgeous designs. They have contrast borders and vivid colors. Mysore silks are light, graceful and elegant and can be chosen for any of the ceremonies during a wedding. If you blend in the right kind of makeup with a red colored Mysore silk saree, the bridal look will not just be grand but amazing as well. Patola silks from Gujarat are double ikat silk woven sarees, which are very expensive and were once worn by only aristocratic and royal families. Assam silk sarees are actually two-piece sarees which are easy to wear and manage, and look elegant and stunning. Called ‘Mekhela chador’, they are intricately woven on looms and look extraordinary. They come in various colors with silver and gold ‘zari’ motifs, and last for years. Muga silk, another kind of silk produced in Assam is golden yellow in color and have a golden sheen which has captured the imagination of designers worldwide. Paithanis are delicately woven by hand from extremely fine silk and is known to be a rich, charming saree from India. Famous fashion designers and design houses, even big stores have their own exclusive collection of sarees for your special day. Depending on your budget, you can find beautifully designed sarees, complete with accompanying accessories, to help you stand out on your wedding day. You choose a designer saree according to the current color or design trend, and wow everyone. Indian weddings are known for being grand and charming, and silk sarees add to the enchanting quality of a classic Indian wedding. 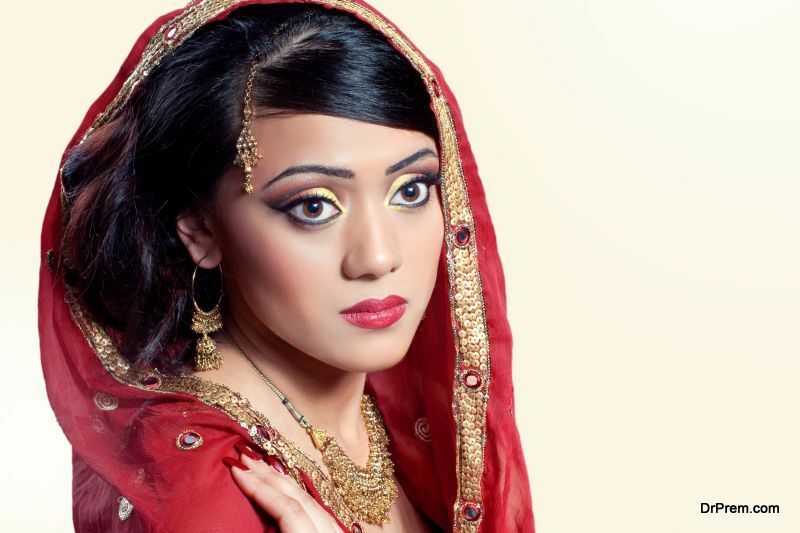 To get the best look, it is also important to select a makeup artist who specializes in bridal makeup to give your look a complete finish. Need help finding classic wedding dresses? What are the debutante dresses?